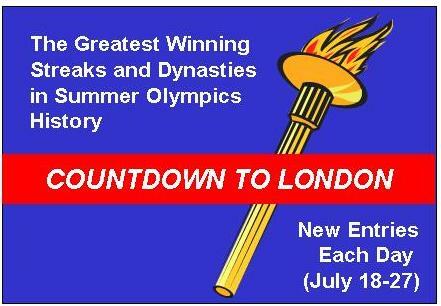 Here is the 10th and final entry of my series on top Summer Olympic streaks and dynasties, leading into tonight's opening ceremonies of the London Games. To see the earlier entries, covering sports such as gymnastics, swimming, track and field, and volleyball, just keep scrolling down the page. 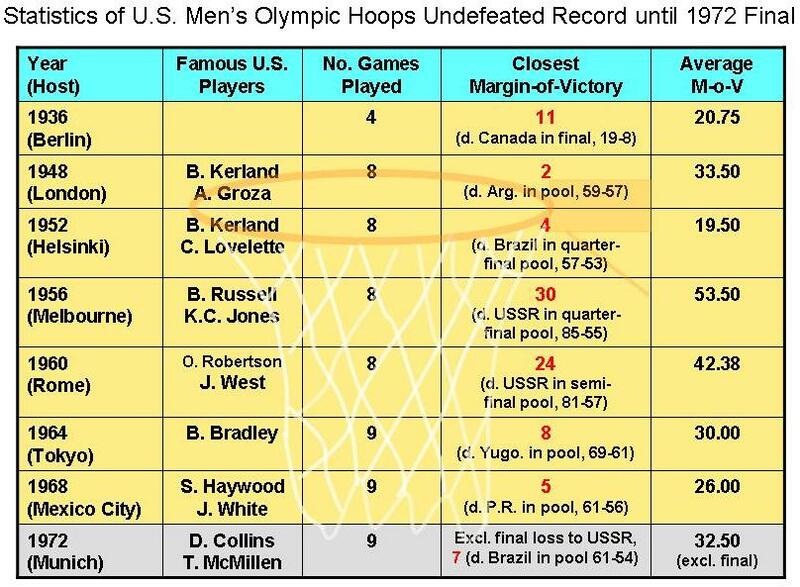 As many readers will recall, the '72 USA-USSR men's title game is best known for the Soviets, trailing by 1 point with 3 seconds left, receiving three chances to inbound the ball (an original and two do-overs) and finally winning, 51-50. An ESPN Sports Century documentary on the 1972 final is available from YouTube (Part 1, Part 2). If you're too young to remember what happened in that game, the YouTube videos are well worth your time. Some observers have argued from a U.S. perspective that, even being in a position to lose in a fluke ending by not being well ahead of the Soviet Union reflected poorly on the coaching and preparation of the American team. I would say there's some truth to that. Of course, in the larger scheme, with the murder of 11 Israeli athletes and coaches during the Munich Olympics (here and here), the results of a basketball game are trivial. I was just shy of 10 years old during the 1972 Olympics. I must say, though, that seeing the video on the '72 US-Soviet basketball game recently, 40 years after the fact, I still found it jarring. Whatever joy the Soviets got out of the game was probably short-lived also. Alexander Below, who scored the winning basket, died of cancer just 6 years later. Whereas the U.S. men won all the early gold medals in basketball and later began to face stiffer opposition (requiring the infusion of NBA players), the U.S. women faced tough hoops competition from the beginning (1976) and then became more dominant over time. 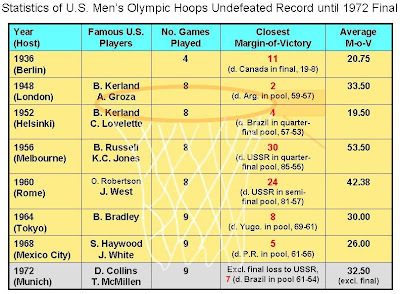 As shown on this Wikipedia page that covers both men's and women's Olympic hoops, the Soviet Union (and its 1992 post-break-up conglomeration of republics known as the "Unified Team") won 3 of the first 5 women's gold medals, with the U.S. winning the others (1984 and '88). However, the American women have won the last 4 gold medals (1996-2008), with the margin of victory always reaching double-digits in the 4 finals. Aladar Gerevich, an Hungarian fencer born in 1910, won gold in 6 straight Olympics ('32, '36, '48, '52, '56, '60; with the Games of '40 and '44 being cancelled due to World War II). Teammate Pal Kovacs won gold in 5 straight Olympics. Cuban heavyweight boxers Teofilo Stevenson (1972, '76, and '80) and Felix Savon (1992, 1996, 2000) each won 3 straight Olympic golds. Hungary’s Laszlo Papp, who fought at various times as a middleweight and light middleweight, also won 3 straight golds (1948, '52, '56). Vasily Alexeev, a Soviet weightlifter, won Olympic gold in '72 and '76, along with 8 straight World Championships from 1970-1977. Hungary men’s water polo program won 5 out of 7 golds from 1932-1964 and has captured the last 3 (2000-2008). Paul Elvstrom, from Denmark, was a four-peat yachting champion from 1948-1960. The German (previously West German) equestrian team dressage program won all 7 gold medals contested from 1984-2008. On to tonight's opening ceremony!